Granada. Hands down my favorite city I visited in Spain. Most are wowed by the Gothic and Renaissance styles of the old cities found in the other European countries - the flourishes, elaborate everything, shiny metals, porcelain, and fine woods - but Spain is quite different because of their very old history with Muslim and Christian rulers, bringing together the mixture of the two styles of architecture. I'm a little biased here because I love in Arab food and art and love all Islamic and Moorish architecture. In fact, I have a fun story to share at the end of this post of someone I met during my short but fun time here. We arrived in the evening, and after dropping off everything at the hostel, we walked up the narrow and winding streets to the Plaza San Nicolas square for a view of La Alhambra and the city at night. Let me tell you, this one one heck of a walk. The area where the plaza is located is at the top of the hill and we were in a very old (but well kept) part of the city. Only a few of the streets had street names and when you pull it up on Google maps on, it looks like a mess - no straight roads at all. You can easily get lost walking around there if you weren't a local and Google maps wasn't accessible. But that's just part of the fun! The walk was definitely worth it to see La Alhambra lit up at night. 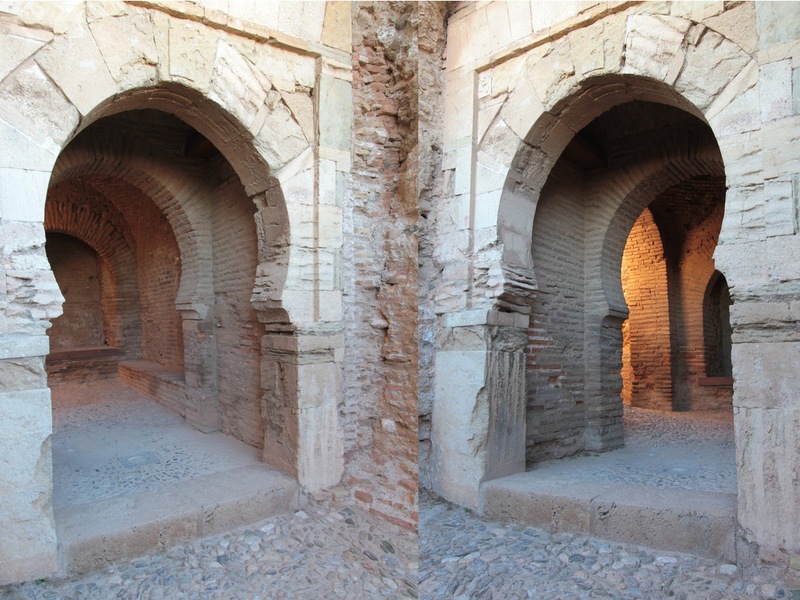 The following morning was spent at La Alhambra. I could only spare three hours but it wasn't enough to even cover a quarter of the entire site. This place was originally constructed as a fort in AD 886 before it was renovated and a palace was built in that location in the mid-13th century. Later on in the 16th century and onwards, Christian buildings and gardens were built around it. Given its historical importance and grandeur appearance, it is UNESCO World Heritage Site and one of the most visited places by tourists in Spain. The oldest part of the site has the ruins of the fort you could walk around and see. These were interesting pathways, where someone standing could easily hide on the other side to see who was walking through (friend or foe) without that person seeing you first. Clever. 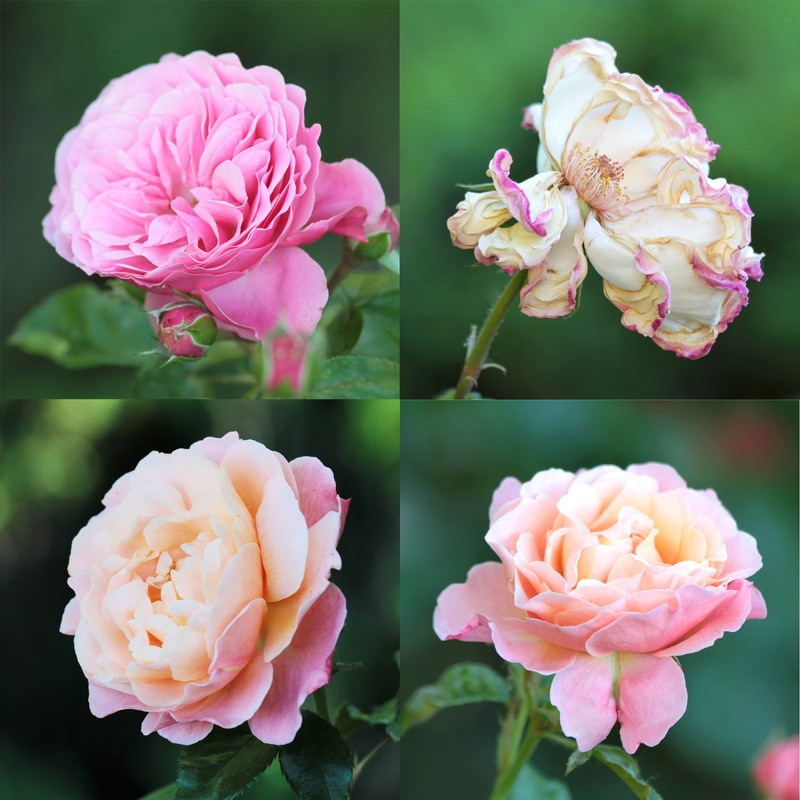 Beautiful roses from one of the well kept gardens, my absolute favorite being the top left corner one, a Juliet Rose. If you're interested in visiting, I suggest buying the tickets as soon as you can, the earlier the better because this is a very popular attraction and you'll need to wait for at least an hour to buy a ticket, depending on when you arrive. Because of the number of tourists that go each day, there is also a restriction to what time you can enter the Nasrid Palaces, the most famous part of La Alhambra, and you won't be allowed to enter other palaces during that time. 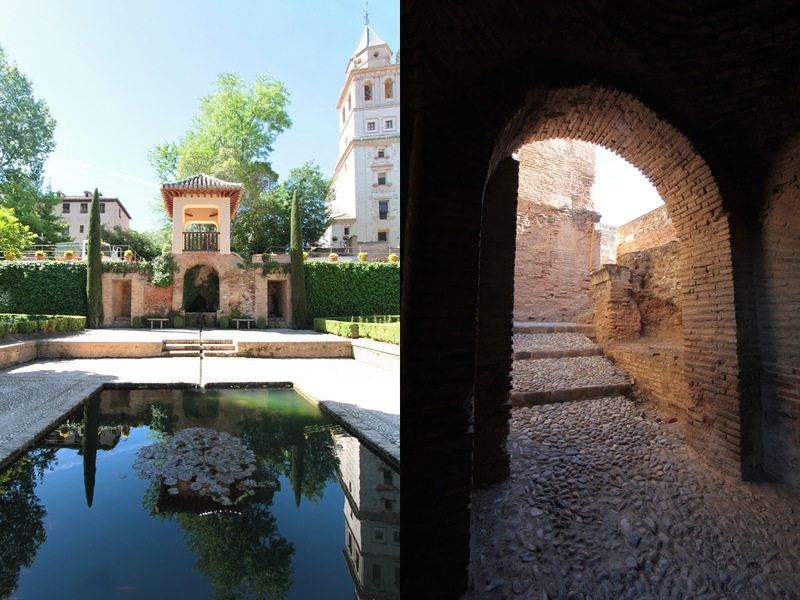 For more information on ticket purchasing, you can visit the Alhambra de Granada website. Stephanie Storytime: The night before, after walking down from the plaza, we walked to a busy street of store owners selling leather and Moroccan style goods, two things I really love. What's also cool too is that I can tell they use real leather and that each leather bag and small goods were handmade. One shop had an owner looked around my age who spoke pretty good English. After browsing through all the leather bags he sold, I settled on a simple, deep brown one. While he was punching holes in the strap (because I'm too short for the strap length! ), I asked how his English was so good. He told me that he studies at the University of Granada but is originally from Morocco, which is very close by, just across the Mediterranean Sea. I asked, "Do you prefer living here or back home in Morocco?" 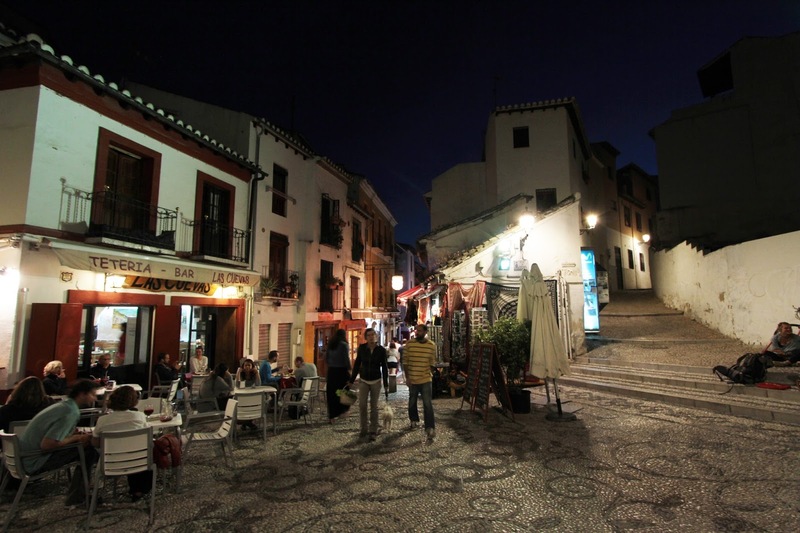 He said that he feels at home in Granada because many people are from Morocco and, in fact, the town looks very much like Morocco so he doesn't feel out of place. How nice is that? It reminds me of the waves of immigrants who went through Ellis Island to New York who settled in parts of Manhattan, like Chinatown and Little Italy, where they could get buy and live well without having to understand any English. Plus, what he told me about the place looking and feeling like Morocco has me very excited about going there one day. It's the top place on my bucketlist I want to visit! So I'm glad I got a little taste of it in Granada. love the shot of the courtyard with the lil pond! !